Be the pork of the town with our terrifically tough and tasty QuattroBone! There’s no mistaking the uniquely Spanish flavour that Chorizo brings to our new World Flavours collection. Like all of our nylon chews, this TastyBone product has been tested on the most vigorous of chewers. Made from 100% virgin nylon, it is guaranteed to last. Uniquely infused with irresistible flavours right through to the core, your dog will never get bored, as the flavour will last for the lifetime of the bone. With every bite your dogs' gums and teeth become stronger and healthier, protecting against infections, tooth loss and vets fees. 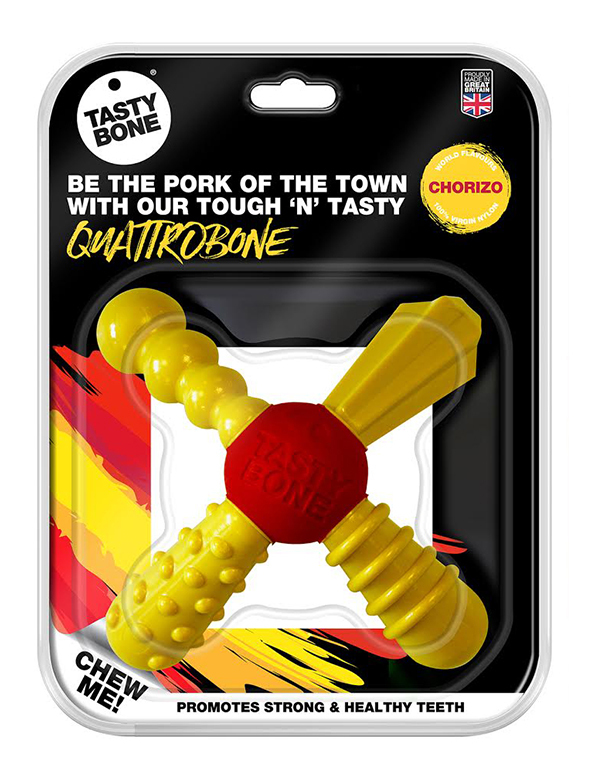 This bone has a lip-smackingly delicious Chorizo flavour and is available in sizes small and large.